Truly, no country celebrates Easter with such elaborate customs and festivities as Greece does. And Greece, in turn, is never lovelier than it is at Easter, an ideal time to visit. At Easter, the days are warm – you could even perhaps enjoy an early season swim – but it’s never terribly hot. The Archaeological sites glow in the sweet sunshine, but are not yet overwhelmed with crowds. And nature is absolutely glorious – the landscape is vividly green and lush; the trees are starting to bloom, and the air is filled with fragrance. This is also the best time to get to know the Greek culture. In Greece, Easter is not a day but an entire season. The anticipation that has been building since Clean Monday – the beginning of lent – builds dramatically throughout Holy Week preceding Easter. Every community, mountaintop, and remote tiny island has its own special twist on the celebrations, but some customs are common throughout the country. 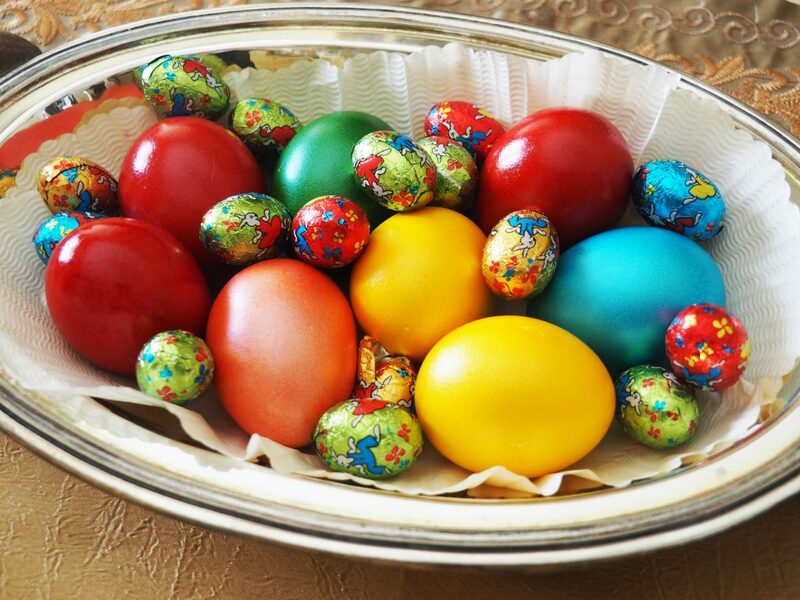 Easter eggs in Greece are a deep red, to symbolize the blood of Christ. The white of the egg beneath symbolizes the resurrection. The loveliest eggs are decorated with leaves and flowers that leave their faint imprint on the egg. The traditional Easter treat is ‘tsoureki’, an egg and butter enriched bread, shaped traditionally into braids. The bread is scented with a hit of mahlepi, an exotic spice. Good Friday, the anticipation of the resurrection intensifies. All day long, church bells peal at slow intervals, filling the air with the sound of mourning. The ‘Epitaphio’ – the funeral bier of Christ – is elaborately decorated with flowers in every church. In the evening, they are carried through the streets in solemn, candle-lit processions. Saturday is for preparations; the air is filled with anticipation and joy. There is plenty of last-minute shopping and lots of cooking. Then, as late evening approaches, everyone begins to dress with care, and goes towards the church. Everyone carries a ‘lambada’- a long, tapered candle. The resurrection is the most joyous moment in the Christian calendar. Churches fill, and the streets and yards outside them. At midnight, the bells begin to ring, and the light of the resurrection spreads from candle to candle throughout the congregation – a lovely, moving sight. And for the truest and most authentic taste of Greece, you cannot miss lamb roasted on the spit. This is Easter Sunday’s traditional delight. Certain places in Greece are particularly known for their Easter celebrations. These islands all welcome Easter with some wonderful customs. Here are some of the best places to experience an unforgettable Easter in Greece. 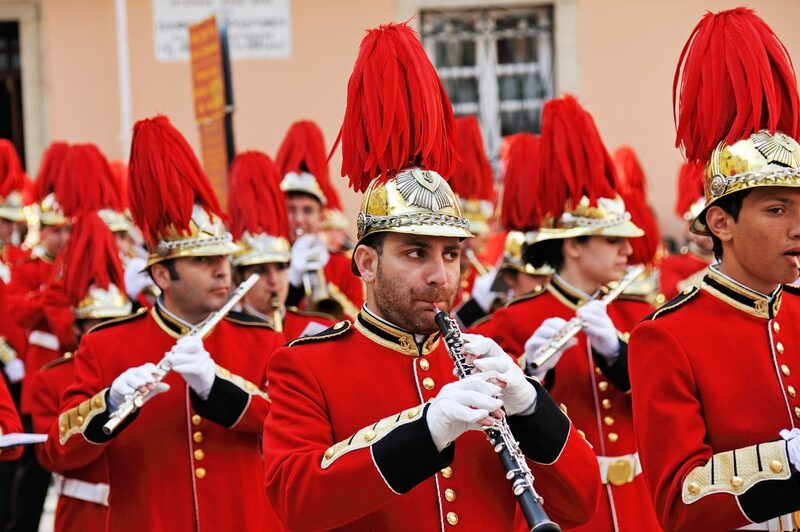 Chios, an island in the north Aegean, has decidedly one of the liveliest Easter customs. In the town of Vrontados, the two main churches – the ‘Panagia Erythiani’ (the ‘Red Madonna’) and Agios Markos (St. Mark) – are built on hilltops about 400 meters apart. These two lovely churches are protected with metal shields and mesh, in preparation for the ‘rocketopolemos’ – the rocket war. The respective parishes shoot rockets, aiming for the bell tower of the other church. Real cannons were used in the spectacle until 1889. All the while, the faithful astonishingly manage to attend mass inside, as the explosions rage. Chios is an elegant and sophisticated island, with neoclassical refinement, and fascinating examples of local vernacular architecture, too. On the island of Crete, slightly quieter pyrotechnics play a role in traditional celebrations. Throughout lent, wood is gathered in churchyards. Then, just after the resurrection, a great effigy of Judas, the betrayer of Christ, is burned. It’s a dramatic sight! This largest of the Greek Islands has many charms. 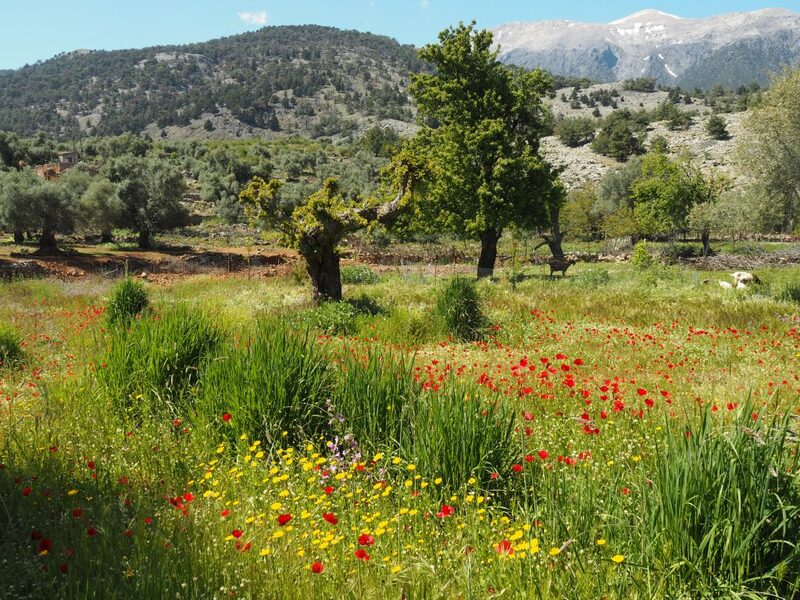 In Spring, it is in full bloom and there are fewer crowds at places like Knossos, famous Balos Beach, or the Samaria Gorge. Corfu, the elegant island in the Ionian Sea, has its own special and dramatic custom. The solemn mood of Good Friday is banished very abruptly – and loudly – on Saturday morning. In Corfu’s main town, upon the ringing of the church bell, the residents hurl great clay pots from their balconies. Some are filled with water, to make even more noise on impact. The custom is thought to symbolically mimic the earthquake that accompanied Christ’s resurrection in his tomb. But it also has ties with a custom leftover from the days of Venetian rule, when people would throw their old possessions from the balconies in hopes that the New Year would bring new things. Cosmopolitan Corfu is altogether a delightful mixture of Venetian elegance, European pedigree, and lush Ionian splendor. Easter is a perfect opportunity to experience its true character. 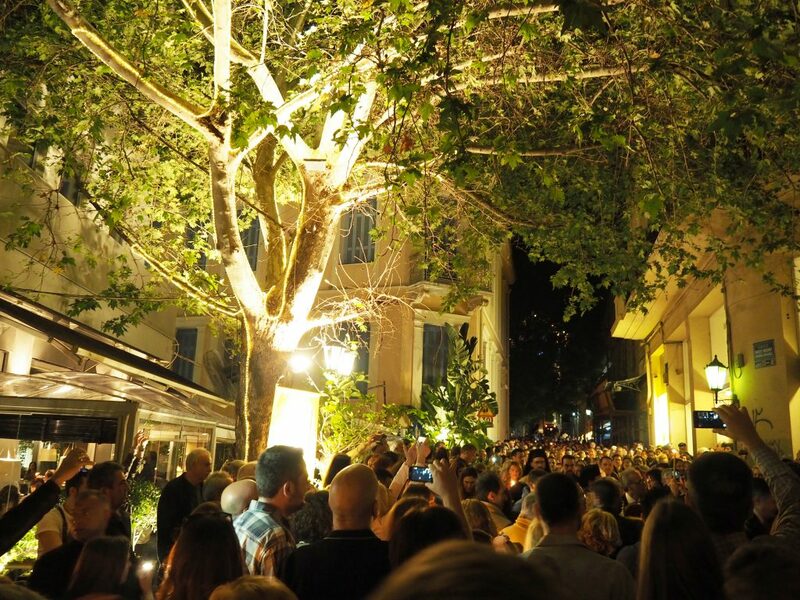 On Syros, not one but two communities celebrate Easter. Syros is home to one of Greece’s largest Catholic populations. Even though Orthodox Easter (determined by the Julian calendar) and Catholic Easter (determined by the Gregorian calendar) are only rarely celebrated on the same Sunday, the Catholics of Syros always celebrate the resurrection with their Orthodox neighbors. The result is a stunning unity of faith and joy. 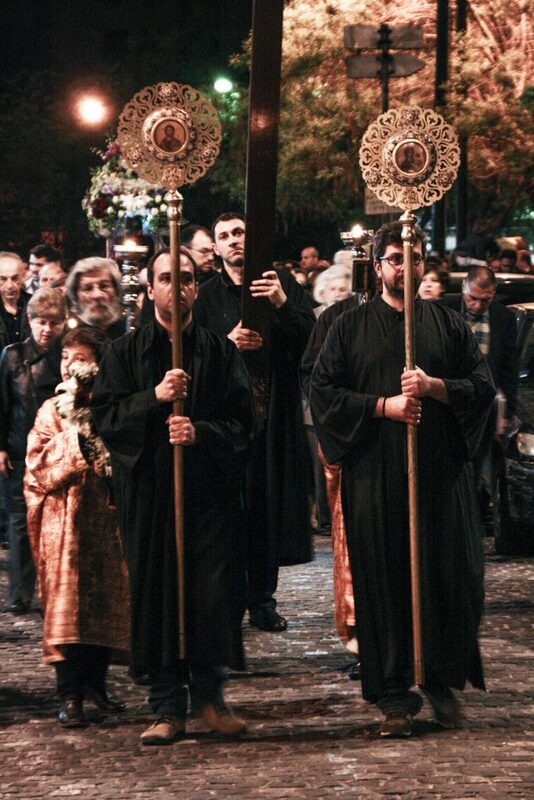 Processions on Good Friday begin from three Orthodox churches and two Catholic churches, to meet in the central Miaoulis Square, an unforgettable sight. 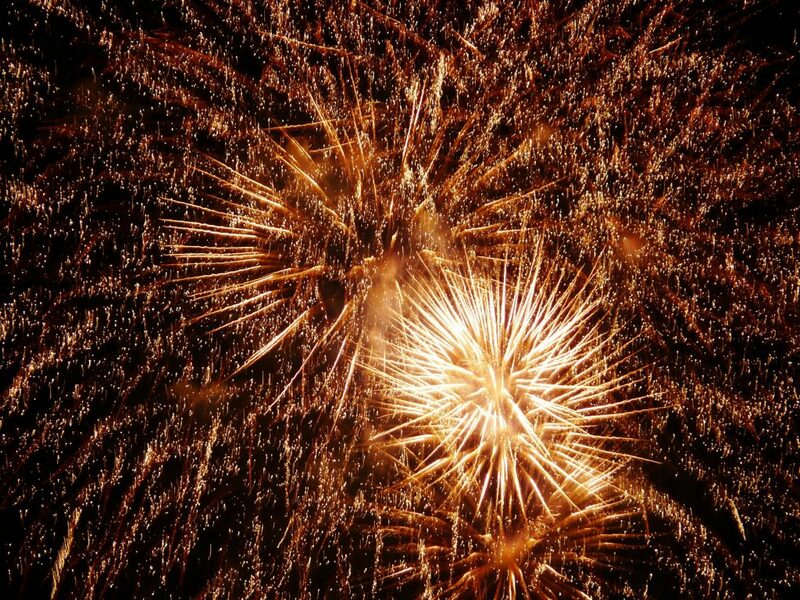 The resurrection is celebrated with a spectacular fireworks display, enjoyed by all. Syros is a magnificent union of rugged Cycladic charm and cosmopolitan culture: Ermoupoli’s Apollo Theater is modeled after La Scala. Many other delights of Venetian and Neoclassical architecture give this marvelous Cycladic Island a particularly elegant ambiance. Have you ever celebrated Greek Easter, or experienced any unique regional customs?